If you’re reading this, you probably live in an area similar to mine: a suburban part of a city that is adjacent to what used to be habitats for animals, some large enough to cause damage. Also, the pedestrian paths are not as great as they should be and the pedestrians tend not to wear light-colored clothing. Add to that a paucity of street lighting and you have a great recipe for an accident that results in an accident causing damage to personnel or property. I can’t begin to tell you the number of times I’ve almost encountered deer or pedestrians with traditional equipment on my vehicle. Most times my heart winds up in my throat from the near-miss. It’s heartening, then, to hear of technology that improves the safety of night driving. BMW is developing a blue-laser diode headlight that is 1000 times brighter than an LED that also cuts energy consumption by a third. A laser, you say? Wouldn’t that be sort of dangerous? 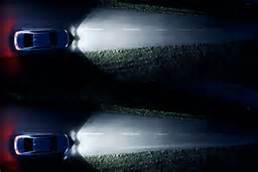 The headlights take the laser light and concentrate it into a non-laser white light that is as bright as daylight which makes it easier to pick out objects and eases eye fatigue – a far better way of illuminating the road than the standard headlights on my 2004 vehicle. The lights switch on in milliseconds and achieve 100% illumination. BMW is also introducing something it calls the Dynamic Light Spot. This is a set of separately mounted spotlights coupled with twin thermal-imaging cameras that illuminate animals and pedestrians beyond the headlight range and displays them on a heads-up display, identifying these potential hazards well before they become a problem for the driver. As this system is technically a high beam, you might think that you would need to constantly shut them down for oncoming traffic. The engineers even considered this and developed the headlights so that the lights can be kept on for maximum visibility but not affect the vision of oncoming drives. I think this is great. Of course, right now the system needs to be downsized and make sure that it’s durable for use on the road. There are also cooling problems to be solved but BMW is working on those now. They are also working to make sure that the lights do not exceed the US light output standard, which is lower than Europe’s but that’s not a significant challenge. Hopefully, this technology will be in place on most vehicles when I look to replace my current vehicle. I can’t wait.